Dupuytren’s disease is an abnormal thickening of the tissue just beneath the skin known as fascia. This thickening occurs in the palm and can extend into the fingers (see Figure 1). Firm pits, nodules and cords may develop that can cause the fingers to bend into the palm (see Figure 2), in which case it is described as Dupuytren’s contracture. Although the skin may become involved in the process, the deeper structures—such as the tendons—are not directly involved. Occasionally, the disease will cause thickening on top of the finger knuckles (knuckle pads), or nodules or cords within the soles of the feet (plantar fibromatosis). The cause of Dupuytren’s disease is unknown but may be associated with certain biochemical factors within the involved fascia. The problem is more common in men over age 40 and in people of northern European descent. There is no proven evidence that hand injuries or specific occupational exposures lead to a higher risk of developing Dupuytren’s disease. Symptoms of Dupuytren’s disease usually include lumps and pits within the palm. The lumps are generally firm and adherent to the skin. Thick cords may develop, extending from the palm into one or more fingers, with the ring and little fingers most commonly affected. These cords may be mistaken for tendons, but they actually lie between the skin and the tendons. These cords cause bending or contractures of the fingers. In many cases, both hands are affected, although the degree of involvement may vary. The initial nodules may produce discomfort that usually resolves, but Dupuytren’s disease is not typically painful. 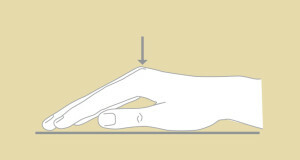 The disease may first be noticed because of difficulty placing the hand flat on an even surface, such as a tabletop (see Figure 3). As the fingers are drawn into the palm, one may notice increasing difficulty with activities such as washing, wearing gloves, shaking hands, and putting hands into pockets. Progression is unpredictable. Some individuals will have only small lumps or cords while others will develop severely bent fingers. More severe disease often occurs with an earlier age of onset. The presence of a lump in the palm does not mean that surgery is required or that the disease will progress. Correction of finger position is best accomplished with milder contractures or contractures that affect the base of the finger. Complete correction sometimes can not be attained, especially of the middle and end joints in the finger. Skin grafts are sometimes required to cover open areas in the fingers if the skin is deficient. The nerves that provide feeling to the fingertips are often intertwined with the cords. 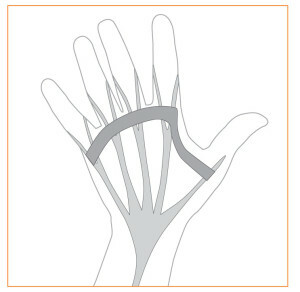 Splinting and hand therapy are often required after surgery in order to maximize and maintain the improvement in finger position and function.